Barn, gouache on paper, 16"x23", s.l.l. Born October 30, 1901 in Philadelphia, PA. Lived in Rochester, Conesus, and Caledonia, NY. Largely self-taught. He emphasized good perspective and effective use of light. Painted Quebec, Rockport, and Western New York. 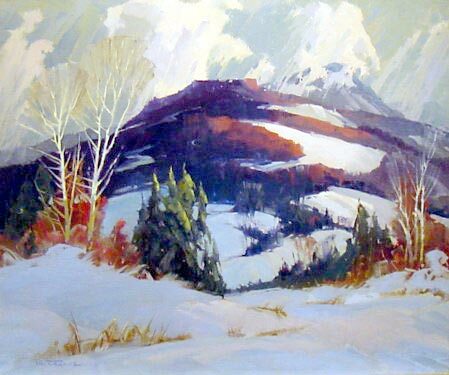 Member: Genesee Artists Group, Art League of Buffalo, Salmagundi Club, Rochester Art Club. Exhibited: Rochester Art Club, 1938 (prize), 1939 (prize). In collection of: Bevier Foundation; Rochester Athenaeum; and Rochester Institute of Technology. 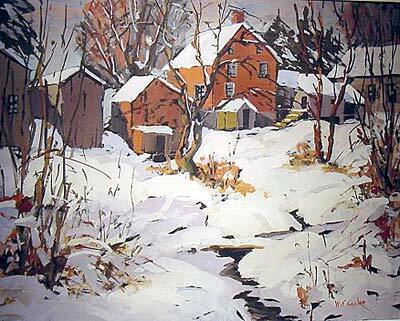 Hillside in Winter, oil on canvas, 25"x30", s.l.l.